Venom & X-Men: Poison X review: It's the '90s-style crossover no one demanded – AiPT! 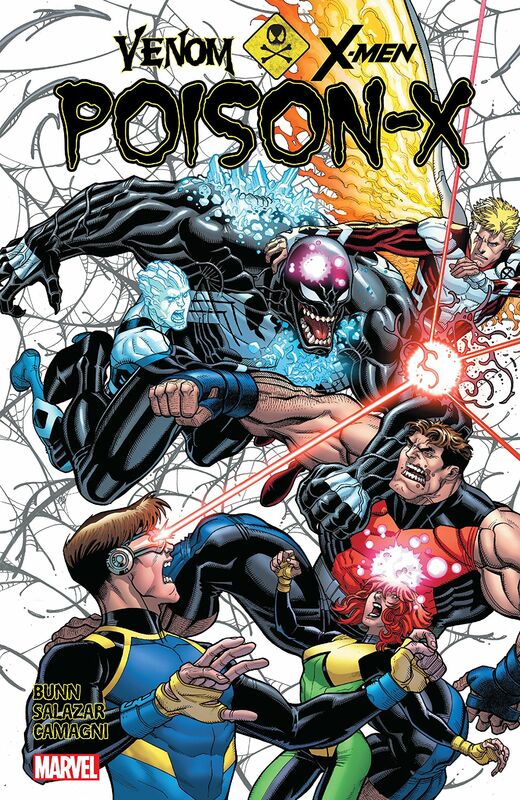 Venom joins the cast of X-Men Blue in the team-up no one demanded: Poison-X! Pointless. Totally lacking in any suspense. A cash grab prequel to another cash grab. There are many ways to describe the X-Men Blue/Venom crossover that was Poison-X and, as you can likely surmise, none of them are positive. Believe me, I take no pleasure in typing out my disdain for this story, as month after month, X-Men Blue was consistently my favorite series. Unfortunately, what started so strong (a perfect 10) went off the rails the minute writer Cullen Bunn brought Venom into the mix. Now, you too can experience that disappointment in the Venom & X-Men: Poison X trade paperback. There’s no denying Venom’s design is one of comics’ coolest, but the character has never really appealed to me. In small doses, he (or is it they) is fine, but a while ago Marvel decided Venom was the new Deadpool and had to appear everywhere. Hey! Why not pair one of the ’90s’ raddest anti-heroes with the time-displaced original X-Men? But how did they come together, you wonder? Well, it’s all Cyclops’ fault–making this the one time #CyclopsWasntRight. You see, Scott’s space pirate father Corsair and his Starjammers got mixed up with the alien bounty hunter Killer Thrill (yep, that’s her name) and her gang of symbiote-powered bad guys. Once Cyclops learns Corsair’s in trouble, he convinces the X-Men that the only course of action is to kidnap Venom and make him join their rescue mission–in space! I may have skimmed over some parts, but does it even matter? This five-part story (yes, five–but it feels even longer) seems like it was dreamed up on the floor of a ’90s child’s bedroom, or on a ’90s teen’s scrap paper. What if Venom teamed up with the X-Men and they all bonded with symbiotes? It’s a question I never asked and never needed answered. But now I know. And I didn’t like it. It seems so strange to me that this particular team of X-Men would willingly allow strange symbiotes to bond with them. And then leave these living suits on for so many issues. These teenage X-Men are here to learn about and avoid the mistakes their older selves made. Jean Grey and Cyclops were corrupted by the Phoenix. Angel had his mind twisted by Apocalypse. Young Beast himself has flirted with the corrupting influence of magic in this series! But, who cares about all that… isn’t is cool to see Warren and Jean with spikey shoulders? Not far into this story, it becomes apparent that Poison-X is meant to be part of a larger Bunn story that began with Venomverse and concluded with Venomized. As I hadn’t read Venomverse, I had no idea what a Poison was or why I should be afraid of them. But, spoiler alert: The Poisons are the worst and if they get you, you’re as good as dead. Except, no, you’re not… if you’re one of the original X-Men. You see, Bunn shot himself in the foot in X-Men Blue’s previous story arc, Cross Time Capers, which revealed the X-Men will eventually return to their own timeline and everything will be OK. So, even if Jean gets taken over by a Poison and Scott thinks she’s gone forever, we know she isn’t. Thus, there are no stakes and this story is just a colossal waste of time and money. And worst of all, you don’t get any kind of resolution when you reach the final part of this crossover. You’re told to read Venomized, which drags things out even longer. But, this isn’t a Venomized review (thank God) and being so negative is bad for my health, so let’s wrap things up and talk about what’s good here. Unfortunately, I’m the type of reader who has a hard time being satisfied with a few positives among far too many flaws, so this is hard. But in between all the nonsense, there are some nice character moments, which are what typically makes X-Men Blue so much fun to read. Scott and Jean, specifically, have an interesting arc, which will hopefully lead somewhere once the characters actually return to the title they call home. In addition, I did find myself enjoying some of the interactions between the constantly annoyed Venom and the young and idealistic X-Men. A few different artists handled this story’s pencils, but Edgar Salazar had to be my favorite. His Venom’s pretty slick with the smaller mouth that reminds me of the version of the character that appeared in Spider-Man 3. Sorry, Tom Hardy Venom fans, but I actually liked Topher Grace’s version! I’m sure there are readers that will pick up this trade and love it–though, I feel like these individuals are probably more Venom and symbiote lovers than fans of X-Men Blue. Personally, Poison-X represents a return to the type of ’90s storytelling that I thought we’d moved past. But I’m also typing this as Deadpool and Cable dominate at the weekend box office, so maybe I’m the one who’s become time-displaced. Unnecessary and seemingly endless, Poison-X is a throwback to the cash-hungry Marvel of the '90s. There are some nice character moments hidden among all the nonsense. Edgar Salazar's Venom is pretty cool to look at. I don't read X-Men Blue for Venom and symbiotes, so what are they doing in my comic? At five parts, this crossover overstays its welcome. Who are the Poisons? What's a Venomverse? Help, I'm lost! Is this the end of Jean Grey? What do you think? Is this the end of the story? Nope! Now go buy five issues of Venomized for the rest of the story! Are you kidding me?